If you're looking for that perfect place for a group or corporate golf outing, look no further because Sawmill Creek Golf Club is that perfect place. Planning an outing can be stressful and sometimes a lot of work, but at Sawmill Creek we have a knowledgeable staff that makes running golf outings a snap. Ryan Spicer, Golf Director, has been a member of the P.G.A. since 1992. He and his staff at Sawmill Creek have a great deal of experience and knowledge and will do everything in their power to make your golf outing a success. Sawmill Creek's goal is to exceed our guest's expectations everyday, every play. Our Tom Fazio designed golf course is one of only two Fazio's in the state of Ohio. Voted by many as the worlds most accomplished architect, Fazio has laid out a beautiful lakeside masterpiece that you won't want to miss. Beautiful creek side marshes, abundant wildlife, and don't forget Lake Erie which helps to make this golf course one you cannot miss. The Pro Shop at Sawmill Creek offers a wide variety of tournament prizes, tee gifts and great merchandise for your outing participants. Whether it's a sleeve of logo balls or a corporate logo shirt, Sawmill Creek can handle all your tournament needs. A member of our friendly pro shop staff will assist you in putting together a gift package that all golfers would desire and they will do it at an affordable price. 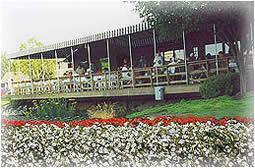 Sawmill Creek Golf Club also offers several unique dining areas for that pre round luncheon or post round steak fry. A beautiful covered deck overlooking the 9th green provides you with a perfect place for your company dinner. The Golf Clubs experienced kitchen staff will make sure that all your food and beverage desires are not just met, but exceeded. Whether you have a small group of 12 or a large corporate function of 180, Sawmill Creek Golf Club has adequate space to make your function a success. To see some of our delicious banquet menu items. So as you can see, the staff at Sawmill Creek Golf Club makes golf outings their business. Conducting over 200 group functions a summer, our experienced staff will take care of every little detail no matter the size of your group. See what some of our past corporate executives have said about Sawmill Creek Golf Club and you will know why Sawmill Creek is the place for you.